1857. Random House. Hardcover. 544 pages. Barchester Towers takes place several years after the events described in The Warden. The Bishop of Barchester has died. The new Bishop brings with him a controlling wife and an ambitious chaplain named Mr. Slope. Mr. Slope’s views and manner put him in sharp opposition to Archdeacon Grantly and his allies. Meanwhile, the well-off widowed Eleanor (Harding) Bold finds herself pursued by two designing suitors. Other characters of note include a beautiful, worldly-wise clergyman’s daughter who calls herself Signora Neroni, the scholarly Mr. Arabin who is called in to reinforce Grantly’s ranks, and the elderly, eccentric Miss Thorne who wishes Saxon customs were still practiced in the present day. I loved dwelling in the pages of Barchester Towers. I can’t keep track of the ecclesiastical positions and titles – the nuances of prelate, curate and precentor are lost on me – but I liked the church drama overall. I have never been a member of a ‘high church’ denomination like the Church of England, but especially as a former pastor’s daughter, I personally connected with a few of the observations. Barchester Towers is a considerably longer book than The Warden and boasts a wider range of characters, and this is all to the good. Trollope excels both at describing the interior thoughts and motivations of his characters as well as at describing how people act within their families, society and the community at large. Reading it reminded me of reading Middlemarch, though Barchester Towers has a lighter touch than George Eliot’s book. take the last chapter if you please – learn from its pages all the results of our troubled story, and the story shall have lost none of its interest, if indeed there be any interest in it to lose. I actually don’t mind if a book keeps me in mystery or suspense, but I also value books that maintain interest even if one knows what is going to happen. I love Barchester Towers for its focus on small-scale ethics. Trollope gets into the mind of his characters as they try to figure out what to do in everyday situations and what to say to each other. Some characters are very concerned with doing and saying the right thing, like Eleanor’s father, Mr. Harding. Other characters are careless and care not. The conversations in the novel are always a treat, because Trollope is able to get across the tone and atmosphere, as well as convey the characters’ inner reactions to what is being said. Well-written dialogue is certainly a prize because it often seems to be the one thing lacking in otherwise good novels that I read. 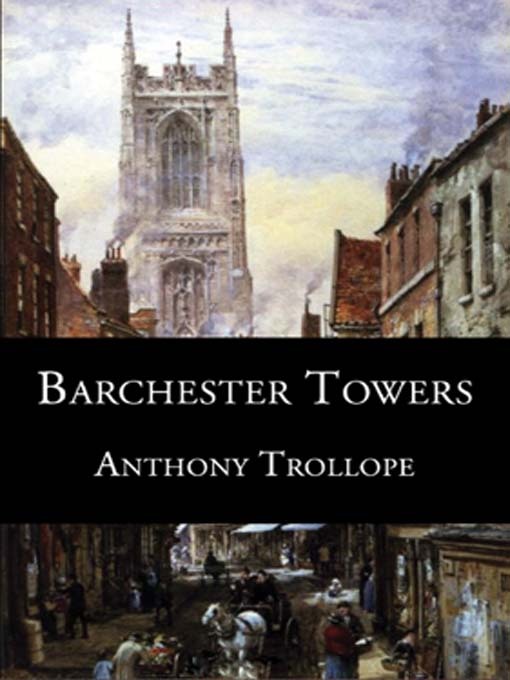 For all that Barchester Towers is generally a comedic novel, it is certainly capable of conveying more melancholic thoughts and realities: Mr. Harding missing his old friend, the bishop; Mr. Arabin admitting to himself his desire for the settled family life of his friends and wondering if it is too late for him to find the same for himself. 2008. Bantam. Hardcover. 276 pages. In the ski resort town of Bald Slope, North Carolina, Josey Cirrini lives a lonely life. Her father had been a prominent businessman in the town and she now she lives at the bidding of her demanding mother. One morning, Josey awakes to find a woman named Della Lee in her bedroom closet, a closet with a hidden room in the back. Josey barely knows Della Lee, but ends up harboring her for a while in her room. Della makes sure that Josey makes the acquaintance of Chloe, a woman who runs a sandwich shop at the town’s courthouse. Chloe’s life is complicated by the way books magically appear around her, tailored for whatever is going on in her life at the moment. Josey and Chloe become quick friends, and find that their lives are already a bit entwined. Josey has nursed a longtime crush on the postman, Adam, who happens to be best friends with Chloe’s ex-boyfriend. I read two books by Sarah Addison Allen last year and found them to be good for when I want a quick, light and enjoyable read. 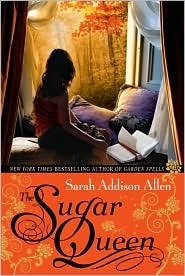 I read The Sugar Queen after I had finished The Woman in White and the Hans Christian Andersen stories. In my review of Sarah Addison Allen’s Garden Spells, I discussed the similarities between that book and the other I had read, The Girl Who Chased the Moon. The Sugar Queen deviates a little from the pattern, such as how the hometown is not the panacea for all the characters. For at least one character, she really would thrive somewhere else. My favorite part of the book was probably the relationship between Josie and Della Lee, mostly for how that plotline played out toward the end. I just like how Della Lee eventually became a very important person to Josie. And a completely random observation: I’d take Chloe’s delicious-sounding sandwiches over Josie’s closet stash of sweets any day. But then, that may be the impression Allen wanted the reader to have. I think there’s only one novel by Allen I haven’t read yet, and that is The Peach Keeper. I find her books to be the right blend for me when I want some escape reading – a little romantic, a little humorous, not too sweet, with likable characters. 2011. HarperCollins. Hardcover. 384 pages. Author Mitchell Zuckoff recounts the story of three survivors of a 1945 plane crash in a remote area of New Guinea. The passengers of the doomed flight had been planning to see a legendary valley, nicknamed “Shangri-La” by some, which was inhabited by native people cut off from the wider world. It was a sightseeing trip intended to give members of the Hollandia base some rest and relaxation. Many of the passengers were members of the Women’s Army Corps (WAC). After the crash, Margaret Hastings, John McCollum and Kenneth Decker are the only survivors. Zuckoff recounts their experiences, as well as the risky rescue actions taken by a small group of mostly Filipino-American paratroopers, and a couple of glider pilots. In addition, Zuckoff chronicles the Americans’ encounters with the native people of New Guinea, and how each group of people’s worldviews shape their interactions. World War II is a seemingly inexhaustible source of incredible stories. Every few years I will read a book that reveals another new facet to that era, as with Nechama Tec’s Defiance, which was about the Bielski Partisans in Belarus. What makes Lost in Shangri-La stand-out are a number of elements. First, it’s set in New Guinea, an island with a reputation for remote regions and native people “untouched by time”. Then, there are all the elements I mentioned in the synopsis: WAC’s, cross-cultural interaction, gliders, paratroopers, and so on. Zuckoff is able to tell a lot of the story based on primary sources. Margaret Hastings, one of the survivors, kept a diary of the time. Others involved gave interviews before they died or wrote letters. Zuckoff was able to interview one of the Americans that was there on the ground during the rescue. He was also able to interview, via translator, several of the native people of New Guinea who were children at the time of the plane crash. I think the story greatly benefits from being written in today’s era. Whereas the media of the time barely acknowledged the heroic actions of the Filipino-American paratroopers, Zuckoff highlights their contribution to World War II, and to this rescue mission in particular. Where the media and the military of that time were often condescending and ignorant regarding the native people, Zuckoff is able to illuminate the native people’s culture and worldview. Indeed, my favorite aspect of the novel is how I got to see both sides of the cultural interaction, and the weird ideas both groups of people had about the other. It’s very refreshing to know both sides of an encounter, and amazing to get both sides in a story over 60 years old. I have little criticism for the writing which I thought was organized and well-balanced between the big-picture and meaningful, vivid details. I did think the beginning was a bit artificially theatrical as Zuckoff tried to build the reader’s suspense. Even after the crash event, Zuckoff sometimes had the tendency to spell out the significance the moment, when it didn’t seem necessary for me. But for some readers, this very same tendency might be the kind of flair they need or want, so it really comes down to one’s taste. 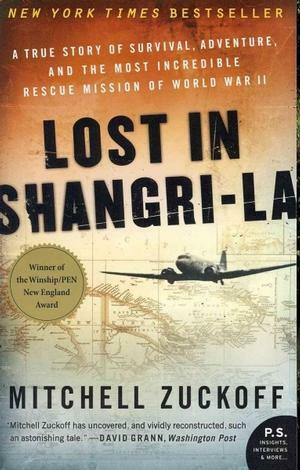 Overall, however, I found Lost in Shangri-La was a really engaging nonfiction read and worthy of its popularity. It also made me want to read more books set in New Guinea and other books about the Pacific front of World War II, which I often feel gets overlooked by the more well-trod ground of the European theater. Man of La Book – “The real strength of the book is the char­ac­ter­i­za­tion of the real-life fig­ures . . . Each one is writ­ten about in a very per­sonal way which makes you want to jump in the pages and shake their hands. 2004 translation. Viking. Hardcover. 437 pgs. 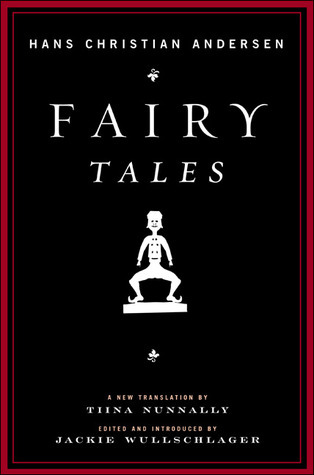 This is a collection of thirty fairy tales written by the famous Danish author Hans Christian Andersen and translated into English by Tiina Nunnally. The collection includes famous tales such as “The Little Mermaid”, “The Ugly Duckling”, “The Little Match Girl” and “The Steadfast Tin Soldier” as well as lesser known tales. The tales are ordered chronologically from when they were published. [Andersen] was the first writer who was not only skilled at adapting existing stories in an original and lasting manner, he was also capable of creating new tales that entered the collective consciousness with the same mythic power as the ancient, anonymous ones. I loved this book. I was familiar with Andersen’s stories, but they were usually the simplified versions put in children’s picture books. I can’t believe I have been missing out on his writing and his voice all of these years. Andersen adds to his stories funny observations, lovely setting detail, haunting dream and vision sequences, and little asides to the reader. His writing is apparently notoriously difficult to translate, which makes me appreciate Nunnally’s fresh and vivid translation even more. I became interested in reading Hans Christian Andersen’s Fairy Tales after hearing a Stuff You Missed In History Class podcast about him. The hosts of the podcast described a man who rose from poverty to become a beloved author and Danish national treasure. The introduction to this book, written by Jackie Wullschlager, does a splendid job in portraying who Andersen was, as a writer and person. Wullschlager explains how his tales reflected his regard for art and story, and also his deep sense of being a lonely outsider. I recommend reading the introduction after reading the rest of the book, not because of spoilers, but because reading about Andersen’s life was more moving to me after reading his stories. “The Little Mermaid” was an exquisite tragedy. I knew that Andersen’s story did not end happily for the mermaid, but the end made my heart twinge anyway. (Well, not the very end, which was a slapped-on lame moralistic ‘lesson’.) “The Steadfast Tin Soldier” and “The Wild Swans” were also very lovely tales. “The Steadfast Tin Soldier” was notable for being Andersen’s first published tale that was not based on a prior folktale or story. “The Flying Trunk” was an odd tale, because half of it consists of the main character telling a story to win the hand of a princess. The story features various household items talking together like high society snobs. “Now I want to dance!” said the hearth tongs, and started dancing. Yes, God save us, how she could fling one leg in the air! The old upholstery on the chair split at the very sight. “Could I have a wreath too?” said the hearth tongs, and they gave her one. “They’re nothing but riffraff!” thought the matches. Andersen has a number of stories that feature anthropomorphized objects. Of course “The Steadfast Tin Soldier” is the most famous, but there is one where a top falls in love with a leather ball; a fir tree wishes always to be where it’s not; a porcelain shepherdess is engaged against her will to a cupboard carved with the figure of a man. Jackie Wullschlager points out in her introduction that Andersen often uses animals, plants and even the wind to act as a sort of Greek chorus in the stories. “The Marsh King’s Daughter” is an odd and dark tale about a girl who is a beautiful hellion by day and a froggish sad creature by night. She is raised by Vikings but decides to free a captured Christian priest. Throughout the story, a family of storks observe and comment. In “The Ice Maiden”, two cats swap gossip about the main characters. “Well I would have meowed,” said the kitchen cat. “What’s proper in the kitchen is not proper in the parlor,” said the parlor cat. Two of my favorite stories in this collection were also two of the longest stories: “The Snow Queen” and “The Ice Maiden.” In “The Snow Queen”, young Gerda goes on a quest to save her best friend Kai from the Snow Queen who has abducted him. Along the way, she meets, among others, a garden full of flowers that talk to Gerda but don’t say anything useful; a couple of friendly crows; and a little robber girl (one of my favorite minor characters who gets an awesome line near the end.) “The Ice Maiden” is set in Switzerland and Andersen both intentionally and unintentionally evokes a bygone world, as he describes Swiss men who hunt on the glaciers as well as the modern locomotive. I found the specificity of Andersen’s fairy tales delightful. I have enough geographical knowledge to recognize Danish place names thrown out in “The Wind Tells of Valdemar Daae and His Daughters.” An aging Andersen talked to girls at a brothel to research his story “The Wood Nymph” which is set in Paris during that city’s 1867 Exposition. An amazing tidbit about Andersen’s tale “The Most Incredible Thing” – published in 1872, it became a symbolic story for the Danish Resistance in the 1940’s. There is so much in these stories that would be wonderful to discuss. There is the way that Christianity operates like another kind of magic, and alongside the fantasy elements. There is the high-stakes element of Andersen’s tales; happy endings are definitely not a guarantee. Apparently “The Story of a Mother” had a different ending and then Andersen capriciously decided to change it. There are also a number of stories that I haven’t mentioned at all that would be great to discuss in detail, but I don’t think this post should be much longer. My recommendation then is to read this collection for yourselves! I had a hard time choosing a final excerpt, because some of the most beautiful passages are also quite sad, and I want to end on a happier note. So here is one from “The Nightingale,” which is a story about how an Emperor takes a nightingale from her natural home to sing in his court but then eventually replaces her with a mechanical nightingale which the court thinks sings better than the real one, until it breaks. The Emperor falls gravely ill and is left without comfort as Death starts stealing the Emperor’s treasures. But Death kept on looking at the Emperor with his big, empty eye sockets, and it was so quiet, so horribly quiet.
. . . And Death returned each treasure for a song, and the nightingale still kept singing. She sang of the silent churchyard where the white roses grow, where the fragrant elder tree stands, and where the fresh grass is watered by the tears of the bereaved. Then Death had such a longing for his own garden that he floated out like a cold white fog, out the window.